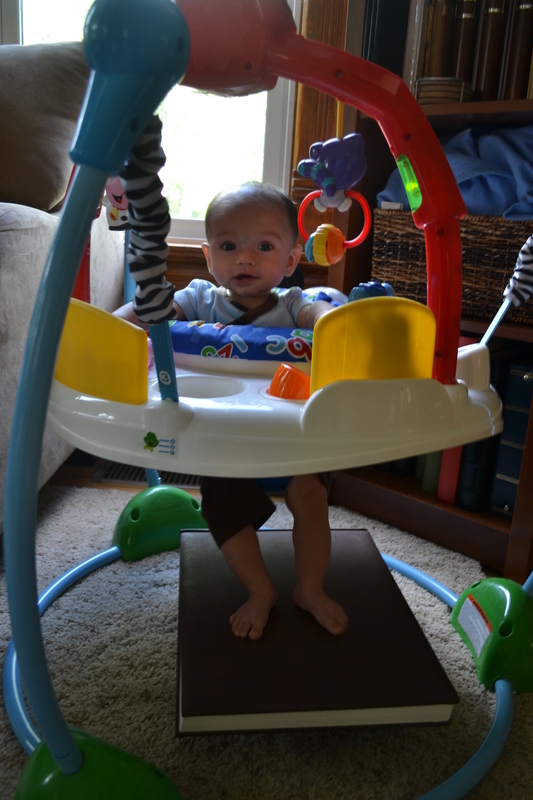 Cooper turned 5 months last week so we decided to work on some new skills now that he is less of a bobblehead doll. 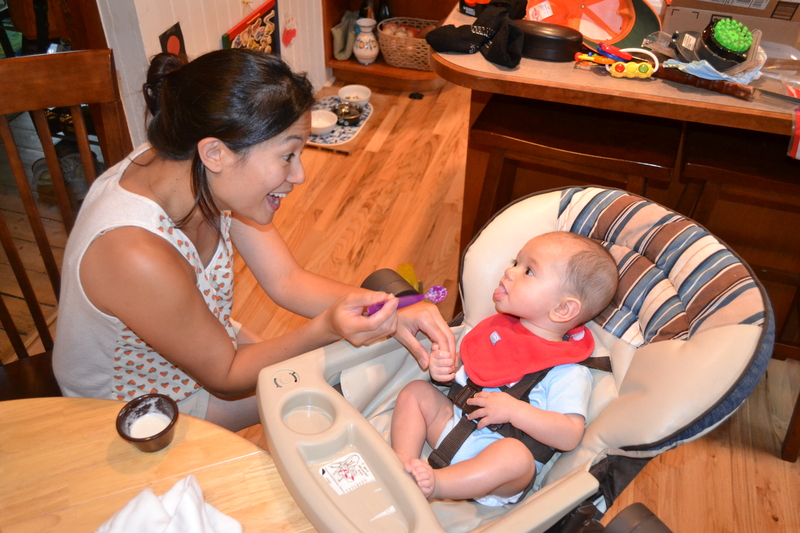 First, we booted Maxon out of the booster at the dinner table in what was the last stage of his 3-in-1 Summer Infant seat and let Cooper give it a try. He did great! So strange to see him sitting like a big kid and so happy about it. We might just fill in that bald spot on the back of his head just yet! 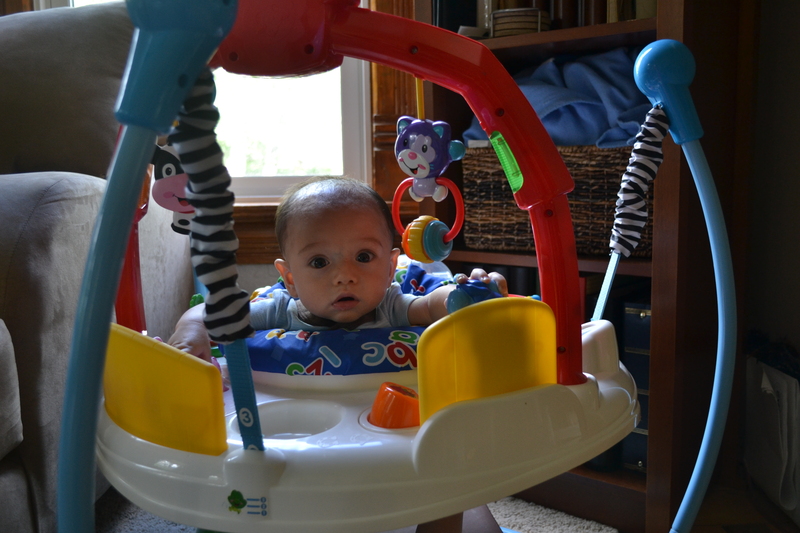 And moving right along in the upright world, we dusted off the jumperoo and gave it a go. His feet technically do not touch the ground, but as the loving parents we are, we raised the ground to meet him. 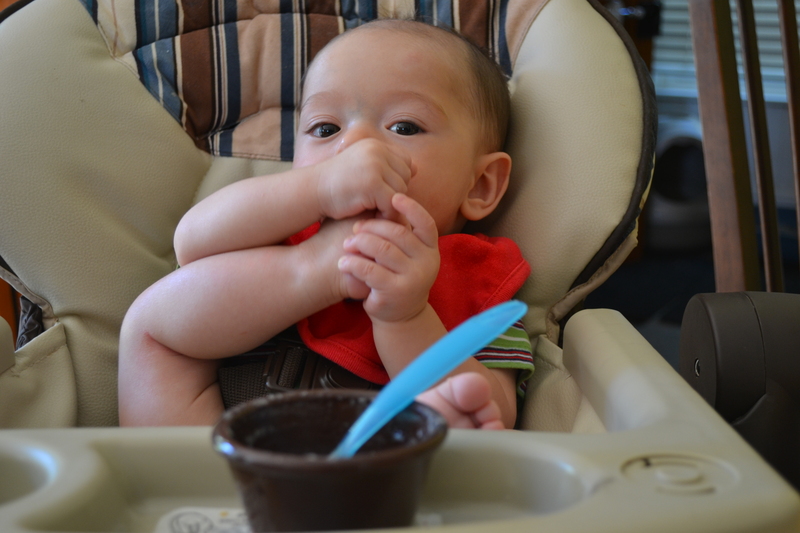 Two weeks ago, we also let him try his first solid food, the bland and mushy wonder that is rice cereal. Since bottle-feeding has been such a failure and my freezer stash of expressed milk wasted, I decided to mix it with formula since we’ll have to go down that road anyways. To our horror (and guilt), Cooper left the dinner table with a red rash around his mouth where the cereal dribbled down his chin. There was even a little dot of a rash where a spot of cereal ended up on his nose. I guess we’ll be putting off that switch to formula for a little while longer! 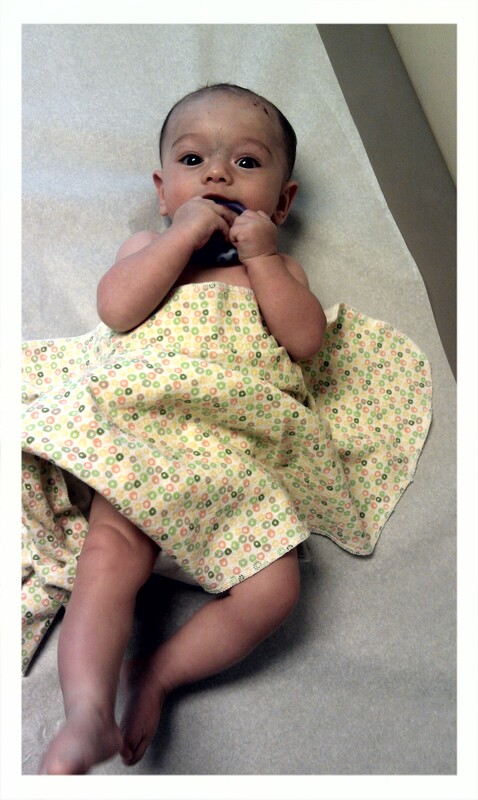 Mommy and Daddy are about to learn a lesson in allergies. And since Cooper’s sleeping habits are still pretty atrocious, I figured this was a good time to transition out of the swaddle. He had been breaking out of it more and more lately and getting less agitated with his arms out so it seemed he was ready for a change. He is still waking up several times a night but it’s no worse than before. 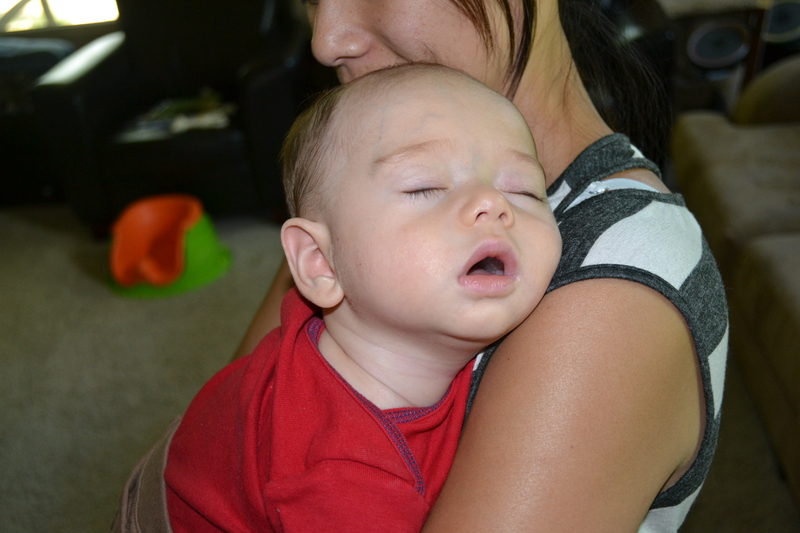 And, as it turns out, he is a side sleeper! We finally got wise to the fact that Cooper just has super sensitive skin. We’re using unscented laundry detergent for his clothes, an eczema-friendly cleanser for the bath, and a spendy moisturizer for his beautiful skin. Now that he has stopped attacking his head with this scratching hands, we’re seeing more hair growing and filling in the baldness on the top of his head. He has a long way to go before his first haircut though! So here we are more than 2 weeks later, and I’m happy to report we have not had to change a toddler poopie diaper since that wonderful day. Unfortunately, we have had to shell out way more M&Ms as rewards but the trade-off is totally worth it. But in more recent and exciting news, Maxon has had dry daytime diapers since this past Sunday! It’s like a switch was turned on in his beautiful little head. We’ve been asking him several times a day for weeks if he wanted to use the potty and, with the exception of right before his bath, the answer was always “no” followed by a furrowed brow and defiant setting of his mouth. On Sunday, we were out at the Museum of Nature and Science all day and out of nowhere, he asked to go to the bathroom. 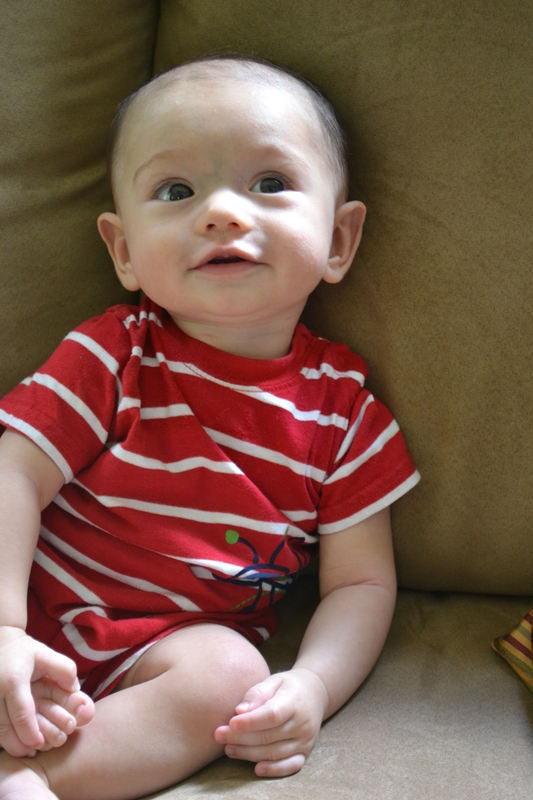 We whisked him away to the closest bathroom and found a still-dry diaper and a very productive time on the toilet! He even tried out the urinal with Daddy later in the day (note to self: will have to work on distance peeing next). I wasn’t expecting too much on Monday at school, but he continued to ask to go to the bathroom whenever he needed to go and he’s been dry ever since, even after naptime. He isn’t too keen on wearing underwear yet despite my asking every morning, but we weren’t pushy with the potty training either and he seems to be figuring that out on his own time too. Big boy steps. Of course, the irony of this whole process is that I started reading “Stress-Free Potty Training” about 3 weeks ago and have just a few pages left. I can’t wait to see how it ends (insert eyeroll here). Get ready for some potty talk. Please skip to paragraph two if this is way Too Much Information. He did it! Maxon pooped on the potty! His teachers at daycare claimed he did it two days ago but I had my doubts (and jealousy). 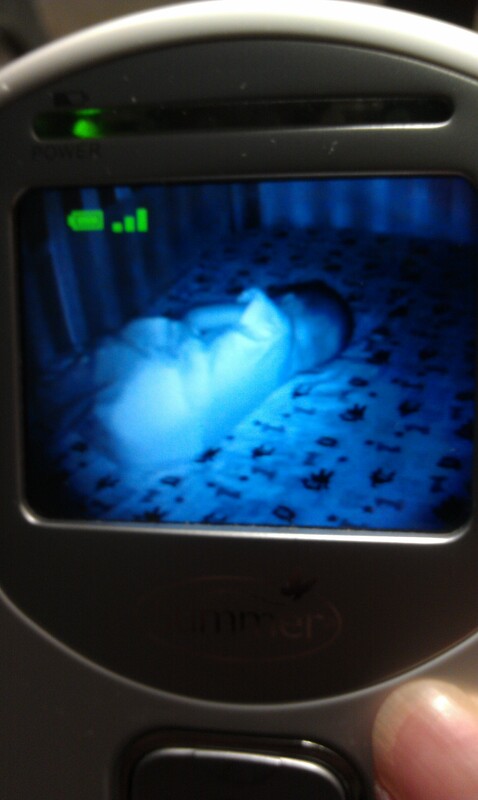 He’s been pretty good about peeing before and/or after his bath every night but we’ve never crossed the #2 threshold. He’s faked us out a couple times in the last few weeks saying he was willing to try to sit on the potty when he’s had to go, mostly encouraged by the moment of bribery of a new toy or M&Ms, but after a minute or two begged for a diaper. But last night, before his bath, I noticed his diaper was still dry and I asked if he wanted to sit on the potty first and he said “I’m gonna poop on the potty!” I still had my doubts that he’d really go, especially since he insisted on taking the time to remove his own diaper (that’s a lesson in patience right there) and wanted to sit on the real toilet, but up he went and then there he went. And then there was much rejoicing! The poop-in-the-potty present, as promised. In more reader-friendly news, we are capitalizing on the sponge that is a two-year-old’s brain. We were talking about (and sort of making fun of) parents that tout their children’s obvious superiority and brilliance in learning another language when really they are probably just memorizing things, much like when Maxon “reads” his books. But hey, why the heck not? 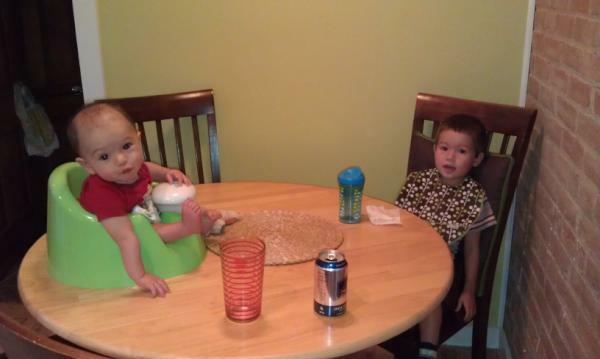 Just from our dinnertime chats alone, Maxon now knows how to count to ten in Spanish. Of course, it’s totally rote and he probably could not identify the number “ocho” if he saw it but it’s a pretty fun party trick. 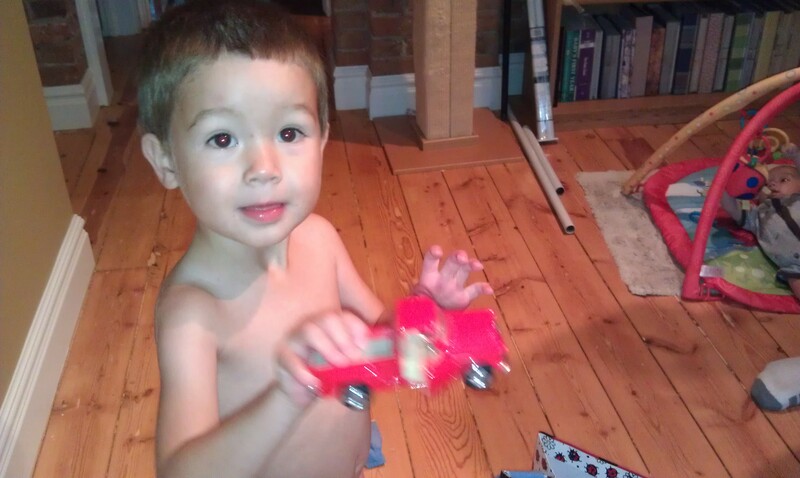 I’m sure my mother will ask why I’m not teaching him Tagalog instead but I can count much higher than ten in Spanish! We’re also working on the beginnings of phonics, like asking what letter certain words start with, and he does pretty well with it already. We don’t always use the same words so we don’t fall into the trap of memorization. We also watch the cartoon SuperWhy, which focuses on writing and reading letters while modernizing annoying fairy tales in a cute way, and he’s starting to play along with some success. It’s still very hit or miss but it’s more hit than miss, and some of his misses are pretty excusable, like C’s versus K’s. If ever one would question the randomness of the English language, it would be during the phonics training of a child. This is such a fun age! …has been brought to you by Maxon Guzek. We have entered the stage where Maxon has opinions and states them all for all to hear. When we visited Fort Matanzas in Florida, we enjoyed a lovely little ferry ride from the mainland to the fort. The boat was piloted by a short-haired, stocky female park ranger, which did not go unnoticed by Maxon. In case I (and those in the surrounding seats) missed it, Maxon confirmed “that man is driving the boat!”. I whisper to him “Actually, Maxon, that’s a lady.” Clearly proud of his intellectual superiority, he strongly reiterated, “no, Mommy, that’s a man!” I’ll have to remember that toddlers are not known for their subtlety. “Daddy, when I have eat my cookie, I’m going to call it a ‘cook'”. And somehow, a lot of these nicknames are made more clever by pronouncing them instead with an “n”. Cooper has become “Nooper”. “Mommy” has become “money”. The Beast and Dikembe are now “Neast” and “Nikembe”. It gets a little controversial when he starts looking around for his little toy pig. 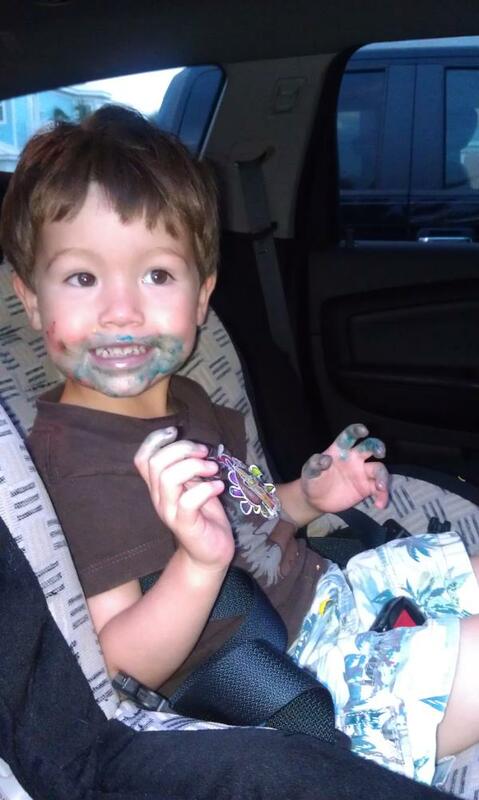 This is what happens when you mindlessly hand him M&Ms on a road trip. So one of his latest games is pulling Daddy’s hair followed by some serious shrieking and grunting. I’m not sure how it came about but poor Mike endures the torture just so we can hear his battle cries. Oddly enough, he doesn’t do that with me, probably because my hair is usually in a typical Mommy ponytail. No, his game with Mommy is to try to stick his fingers in my mouth. He thinks it’s totally hilarious. Okay, maybe I think it’s pretty cute too. And even though he knows how, Cooper still isn’t all that into rolling over. He’s trying harder to roll from back to front but he doesn’t seem all that interested in going from his front to his back. He’s even trying to do it in his sleep, much to his dismay. And while we still swaddle him for naps and bedtime, we have come to a mutual understanding that it is merely how we begin the sleeping process and we often find him with his left arm outstretched shortly after leaving his room. We can’t blame the little guy for wanting to branch out at the ripe old age of four months.